MILWAUKEE – It was a matchup worth the price of admission; Brewers flamethrowing reliever Josh Hader against Cubs slugger Anthony Rizzo. Lefty on lefty. Power on power. She won the battle, and the Brewers won the game. Hate won the battle, and the brewers won the game. 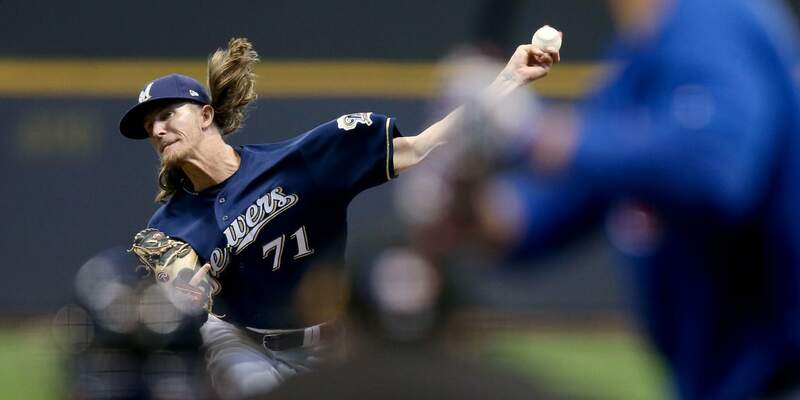 Hader celebrated his 25th birthday by striking out Rizzo with high heat to beach and pair of cubs runners on base in the seventh inning, then channeled his inner Rollie Fingers to complete a rare eight-up, eight-down save in the brewers' 4-2 win over the Cubs on Sunday at Miller Park. 00, a two-run shot off Kyle Hendricks in the first inning to start a three-RBI afternoon. With Travis Shaw's run-scoring single, Milwaukee built a 4-0 lead. Cubs catcher Willson Controlled halved that advantage with a two-run home run in the sixth off Zach Davies, and Chicago was threatening again in the seventh when brewers manager Craig Counsel replaced one lefty (Alex Claudio) with another in Hader to face the heart of the order. Hate, pitching for the first time in five days, fired his firmest of the season at 98.3 mph on the way to inducing a Bryant pop-out before touching 98.4 mph during an eight-pitch battle with Rizzo that ended with a strikeout on a fastball up and in. Hader threw 13 pitches that inning, 10 pitches in a perfect eighth that started with a strikeout of Javier Baez, and 13 more pitches in the ninth to seal a fifth save in as many chances. With three more strikeouts Sunday, Hader has been 13 of the 25 but he's faced this season.